Donna is a 20-year real estate professional working in land banking, homebuilding acquisition, commercial project management, and master planned community land development. She brings a diverse, well rounded perspective to the team. 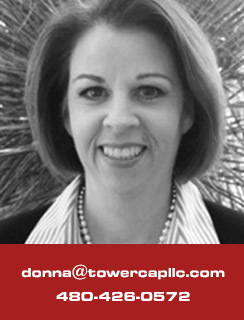 Donna started her real estate career at SunCor Development where she managed public / private infrastructure and subdivision improvements bidding, construction documentation, contractor lien compliance, insurance compliance, and assisted with budgeting and forecasting for approximately 11,000 acres in Palm Valley, Arizona. Donna’s responsibilities later expanded and included residential and commercial entitlement processing (including general plan and planned area development amendments), negotiating and documenting intergovernmental agreements, rezoning various properties, creating and administering master signage plans, creating and monitoring design guidelines, and identifying and obtaining various development related easements. She gained experience with public presentations before City Council, planning & zoning, and design review committees while obtaining entitlement approvals. She also managed title review and resolution for a 350-acre master planned community. Capitalizing on her “developer experience”, Donna moved into the home building industry with Engle Homes. In her first three years at Engle, Donna was responsible for due diligence and land feasibility assessments as the Arizona Division’s operations expanded from 500 to 2,000 annual homes sales. Her responsibilities included the preparation and submission of appropriate documentation (including financial feasibility analysis and project risk assessment) to the Corporate Asset Management Group as well as regional oversight on land bank option and construction agreements. Donna worked as a senior project manager at Evergreen Devco, where she managed the development of multiple neighborhood market stores including entitlements, due diligence, design, permitting, and budgeting on behalf of Fresh & Easy in Southern California. Prior to joining Tower Capital, LLC, Donna spent four years at CDCG Asset Management, LLC as managing entitlements, development and lot disposition for their nearly $1.5 billion land bank investments. Donna graduated from Arizona State University with a Bachelor of Science in Design as part of the School of Architecture’s renowned Housing and Urban Development Program at Arizona State University.